TV Tokyo announced today that it will start airing a live-action TV drama based on ONE (One-Punch Man)'s Mob Psycho 100 action comedy manga in January 2018. It is the station's fourth collaboration title with Netflix for its Thursday midnight block "Mokudora 25," following Million Yen Woman (April-June 2017) starring Yojiro Noda (RADWIMPS), Sabolyman Kantaro (July-Spetember 2017) starring kabuki star Matsuya Onoe, and the ongoing Re:Mind (October 2017-) starring girl idol group Keyakizaka46. The drama series has been airing at 25:00 every Thursday. 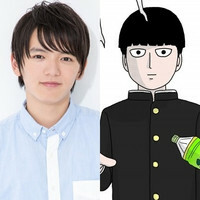 17-year-old Tatsuomi Hamada, who currently stars in the latest Ultraman TV series Ultraman Geed as Riku Asakura/Ultraman Geed, is confirmed to cast as the protagonist Shigeo Kageyama, who wants to live a normal life despite of his powerful psychic abilities. and Kei Kunii (Hell Girl: Three Vessels) provide screenplays.